If you know that your new baby will be a boy and you are wanting something different to decorate the nursery with, could I recommend this adorable set by Trend Labs? I just love this very boyish look with guitars, musical notes and splatter paint done in shades of blue, brown, tan and orange with the borders and some fabrics using a vintage looking plaid. 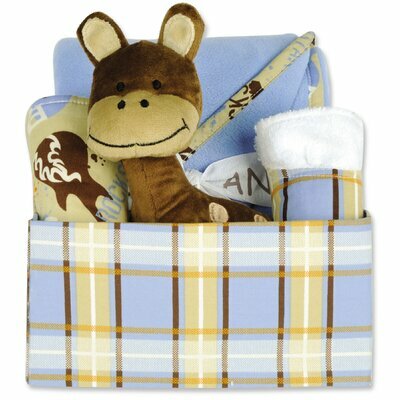 The four pieces included in the set of bedding are a crib sheet, pleated crib skirt, bumpers and an appliqued comforter bordered in the plaid design. Besides the pieces shown here there are also curtain valances, diaper bags and other items that fit this cute little theme for a baby boy nursery. 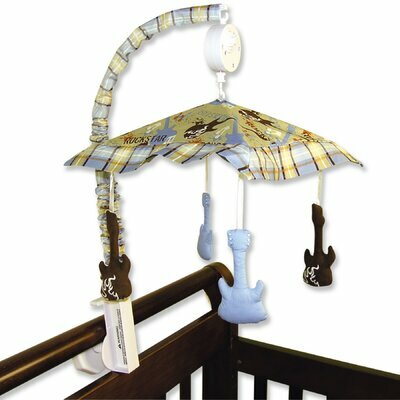 What I absolutely love about this guitar and rock star theme is that it can grow with your little guy. Nothing is so babyish that it can not be used when he becomes a toddler. It will be fun to find pieces to go with this theme, too. Maybe find a decal of a guitar to place on a wall. 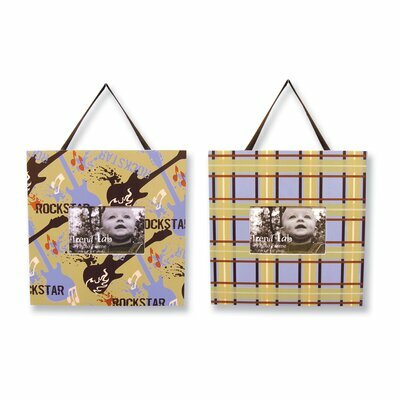 If I were decorating the nursery and using this rock and roll theme, I would choose brown furniture. I would also take the fabric to the paint store and ask them to mix a paint that is one or two shades lighter than the blue and use that on the walls. I would paint the woodwork either brown, a darker blue or white. To add a little more of the orange to the room I would purchase a wood lamp and paint it the shade of orange in the fabric. Again, the paint store can match it for you. Then I would get a simple tan lampshade to top it off. To dress the shade up a little bit I would take the guitars on the mobile and trace a pattern. Then take felt and cut the pattern out and glue them to the shade. Maybe add a few colored sequins to the guitars to dress them up a little. Something fun for the walls would be some old 45 rpm records. 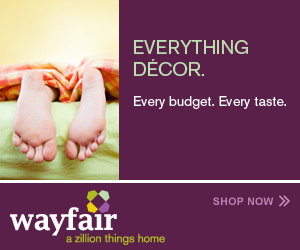 Just hang some on the walls in a grouping of 3 or 5. Old vinyl record album covers would also be cute on the wall. Another idea would be to hang a poster of yours and dad’s favorite rock band on the wall or a vintage rock concert poster. See what I mean? This could be a really fun way to use your imagination using a rock theme and getting creative with the rest of the decor. All the items that you add will make the baby room for your little boy unique and different from anyone else’s.